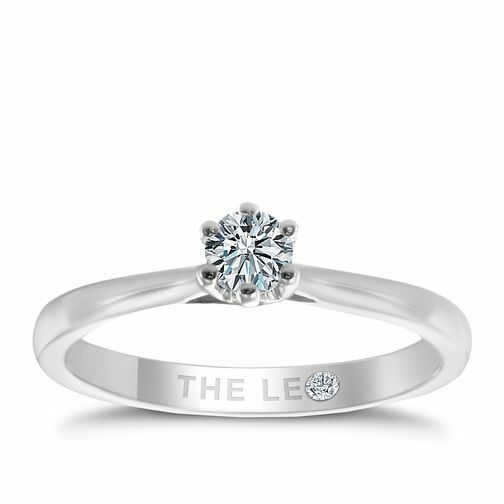 Utterly captivating, this irresistible piece by Leo Diamond is crafted in sleek 18ct white gold with a stunning solitaire diamond, totalling 1/5ct. With its unique facet design, the Leo Diamond is the first diamond to be independently measured for its fire and brilliance. Certificated by IGI & Gemex. Leo Diamond 18ct White Gold 1/5ct CT I-P1 Diamond Ring is rated 3.7 out of 5 by 3. Rated 5 out of 5 by Anonymous from Engagement ring, I love it so elegant and classy. Sparkle in the light which every one comments on Beautiful ring, I was brought it as my engagement ring and I was over the moon. Hasn't needed cleaning yet and the sparkle and colour has kept perfectly. Rated 1 out of 5 by Anonymous from So disappointed I bought this ring November 2017 and got married on the 21st March 2018. The ring lost its colour within weeks and I was absolutely devastated. Now if this was something hat happened over time, fair enough, I would understand. However, this is not something I expected to happen within the space of 7 weeks. I feel gutted that this is my wedding ring and it has already yellowed and to be quite frank looks atroscious. I wouldn’t waste my money! Buy something else!